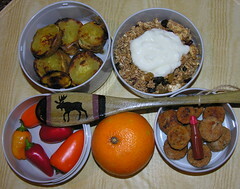 Midweek, my Mr. Bento will have these things in it for Wednesday, November 28, 2007: kimchi fried rice with TJ's seafood blend, tomatoes + moosepicks, diced peaches, shredded wheat, and greek style yogurt with orange blossom honey. The Redskins mug is to toast Sean Taylor. He'll be missed. 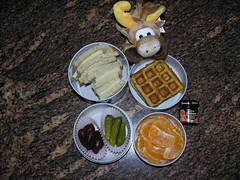 * Breakfast of belgian waffle and strawberry preserves, with a sectioned orange. 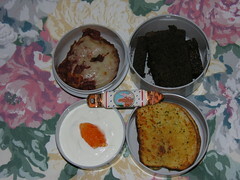 * Lunch of a swiss cheese on rye sandiwch, with dill pickles and pickled beets. The leftover waffle is from Sunday brunch at Bistro Belgique Gourmande with our youngest son. We sent him back to college Sunday night after his Thanksgiving weekend vacation. Next time he's home, we'll go back to the restaurant for the moules meunière and fries with mayonnaise. 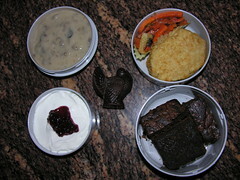 Tuesday was a telework day for me, so I made a double lunch, and packed this in my Mr. Bento for Wednesday, November 21, 2007. End of the week. Sunday is The Dallas Game. 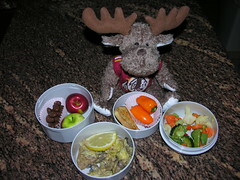 But on Friday, November 16, 2007, this is what will be in my Mr. Bento: sauteed veal with artichokes and mushrooms in a lemon sauce, mixed vegetables, garlic toast with a couple of little peppers, and a couple of little apples and chocolate-covered raisins. 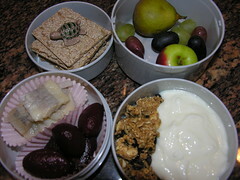 Herring again in my Mr. Bento for Thursday, November 15, 2007. It has the company of pickled beets, onion rye bread, a half of a tomato, a little apple and a little pear. Granola for breakfast. 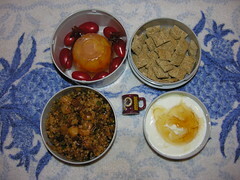 I'm using a Grecian formula in my Mr. Bento for Wednesday, November 14, 2007. There are some chunks of chicken souvlaki over pita, with a couple of tomatoes. The tzatziki sauce will top them at lunch. Sides are rice and dill pickles. 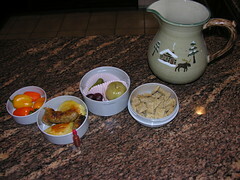 Desserts and snacks are a tiny apple, grapes, and a Greek candy. The breakfast bowl has granola. Multigrain wasa (it has a friend). Little apple, little pear, mixed grapes. Help save the sea turtles! Seven, come eleven. 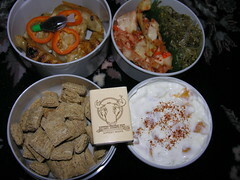 Wednesday, November 7, 2007, will find these in my Mr.. Bento. 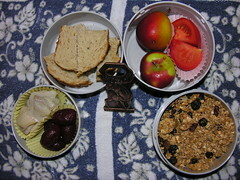 I picked up some nice granola for breakfast from :Great Harvest Bread. 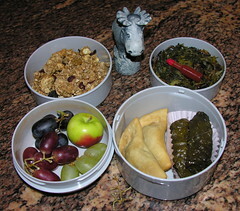 Lunch is Cedar Cafe's sambousek and stuffed grape leaves, plus a bowl of hendbeh with a hotsauce bottle floating on top. Dessert is a tiny apple with mixed grapes. P.S. Sambousick is pastry dough, filled with ground beef, lamb, pine nuts, and spices, deep-fried. Hendbeh is sautéed chicory with onions & garlic. 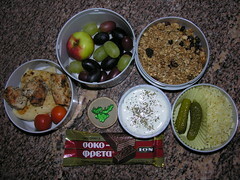 The month begins and the workweek ends, with these contents in my Mr. Bento for November 2, 2007. The big bowl has brown rice topped by crab salad and wasabi mayo. 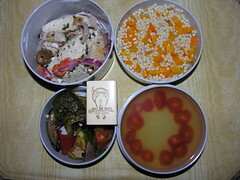 The soup bowl is vegetable pasta. 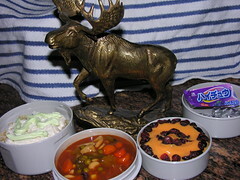 Dessert is orange-colored vanilla pudding with craisins. The snack is grape chewies.